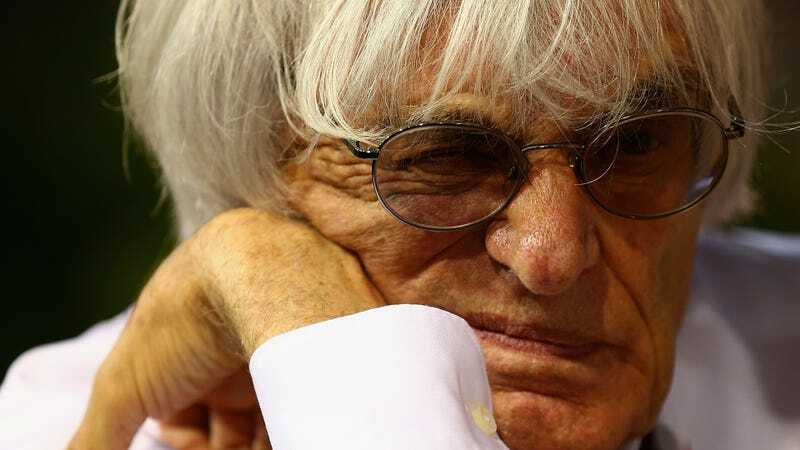 Bernie Ecclestone, the billionaire king/muppet/supreme warlock of Formula One for nearly four decades has stepped down from his current position over the continuing bribery trial against him in Germany. Don't get too excited yet. Ecclestone, mad wizard nymph that he is, will likely retain his power. A German court has already found Gribkowsky guilty of accepting money from Formula 1, and sentenced him to eight and a half years. Ecclestone has admitted that he paid Gribkowsky. Ecclestone has not, however, admitted that he bribed Gribkowsky (a subtle distinction, I know), and that's what he's going to court for now. So Ecclestone is stepping down from his position on the board of Delta Topco, part of the web of corporate identities headed by Ecclestone that maintain control over F1. According to the BBC, though, he'll still be in charge of day-to-day operations. That means that nothing has really changed at the top of F1 for now, but if Ecclestone is found guilty, somebody new will take over.